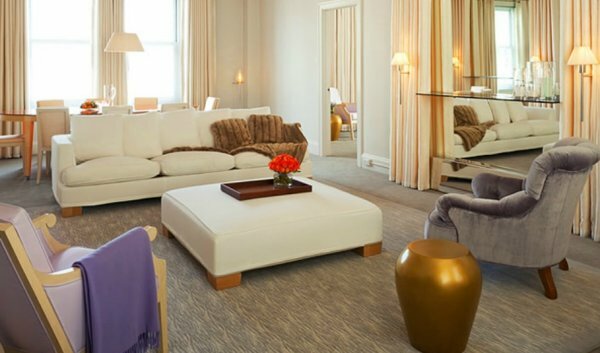 An inspired fusion of old-world hotel elegance with distinctly contemporary energy and glamour, the nearly century-old Clift’s modern and daring sense of diversity perfectly captures the city’s spirit. Steps from Union Square shopping and the legendary Nob Hill, Clift is perfectly located for sightseeing, shopping and socializing. 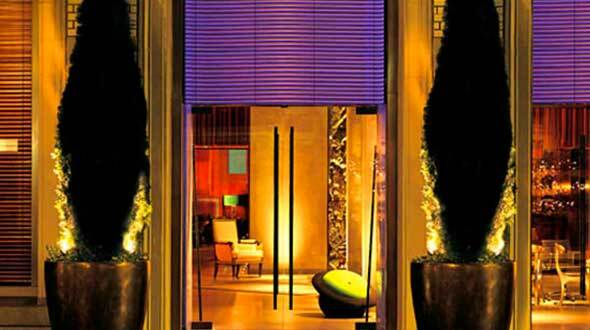 Clift’s classic stone exterior opens onto a glowing purple entryway that prepares guests for the wonderland within. Designed by Philippe Starck, the soaring lobby contains one of the most eclectic furniture collections in all of California, with chairs from Ray and Charles Eames, a coffee table by Salvador Dali, a surreal stool by Renee Marguerite, and a sculpture custom made by William Sawaya. 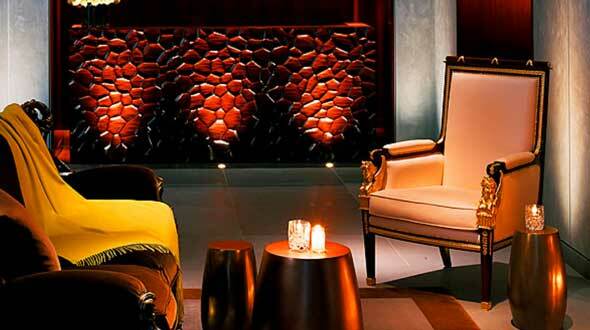 The centerpiece is a thirty-five-foot fireplace with a Bronze chimney sculpture by Gerard Garouste. The thrilling monumental scale and fantastical furnishings create a dream-like composition that is the cornerstone of Clift’s magic. Located on the 2nd floor and filled with natural light, the Fitness center is open 24 hours a day and features state of the art fitness equipment. Accessible via guest room key. Clift guests also have access to a full service fitness club, including pool, for $25 per day. (2 blocks away). Complimentary bicycles are also available for guest use on a first come, first serve basis. 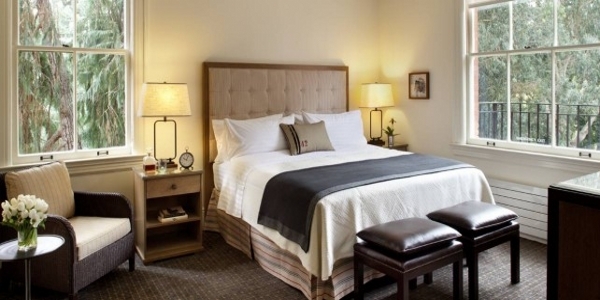 Reservations can be made via the hotel Concierge. Clift’s stylishly appointed Meeting Rooms are an ideal alternative to the typically staid conference room. On the Mezzanine level, three stunning rooms featuring dramatic white velvet curtains, etched Venetian mirrors and Philippe Starck’s modern interpretation of classic banquet furniture are available for meetings & events. Formerly the private home of the late Frederick Clift, the hotel’s original owner in 1913, the Spanish Suite now serves as an elegant private function room. Many period details remain, including the rich wood-paneled walls, two enormous crystal chandeliers, and wood-burning fireplace. 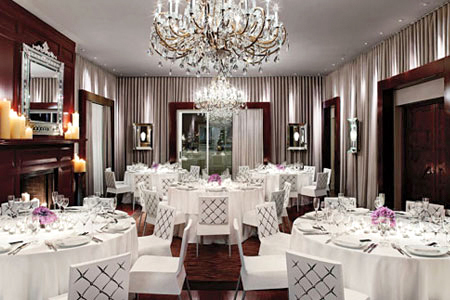 The classically chic custom furnishings, rich velvet drapes, lushly landscaped terraces and panoramic city views make the Spanish Suite the ultimate venue for a wide variety of private functions. The 24-hour Business Center includes computer workstations with laser-jet printers and high-speed Internet access. With its plush, sofas and roomy chairs, the adjacent Business Lounge is a comfortable place to read the newspaper or catch up on the day’s events via high-tech plasma monitors. A wedding is all about the details. From the velvet curtains, etched Venetian mirrors and enormous crystal chandeliers, to lushly landscaped terraces with panoramic views, designer Philippe Stark’s eye for detail creates a truly enchanted venue at this modern interpretation of a San Francisco classic. Spaces available include: Ava, Lobby, Living room, Velvet Room, Mezzanine Foyer, Private Apartment, Redwood Room, Rita, Sophia and Spanish Suite. Life becomes theatre in this striking space, featuring beautifully crafted furniture custom-designed by Philippe Starck. English sycamore is accented by velvet, leather and chrome. A wooden “wheelbarrow” chair inspired by Man Ray is illuminated by a custom Venetian Murano glass lamp. The luxurious 400 thread count bedding, down duvet and Merino wool blanket are a perfect complement to the room’s muted elegance, contributing to its superbly sensual, tactile quality. Indulge in lavish MALIN+GOETZ bath amenities or enjoy entertainment on demand and in-room wireless. The beautifully crafted furniture in this room includes a Starck-designed English sycamore custom sleigh bed and, inspired by artist Man Ray, a whimsical wood chair in the form of a wheelbarrow. 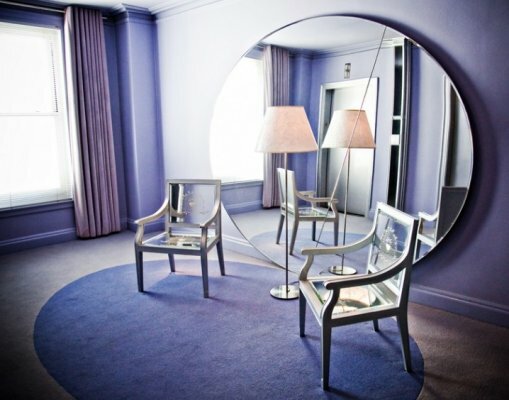 Floor-to-ceiling mirrors create a soothing ‘infinity effect.’ Sumptuous MALIN+GOETZ bath amenities refresh and restore. Enjoy the state-of-the-art entertainment center and wireless access when you want to tune in or log on. Revel in the luxurious 400 thread count Italian percale bedding, down duvet and imported Merino wool throw blanket when it’s time to rest. Dive into the best of everything: beautifully crafted and detailed furniture designed by Philippe Starck, lavish 400 thread count Italian percale bedding, down duvet and pillows, entertainment on demand, in-room wireless and luxurious MALIN+GOETZ bath amenities. Your every need is met in style. And with panoramic views of San Francisco, it’s easy to enjoy everything around you, both inside and out. The Studio King is generously proportioned and elegantly decorated with luxurious fabrics, including silk, leather and velvet. Tranquil shades of grey and lavender combine to create a richly layered and sophisticated tonal experience. 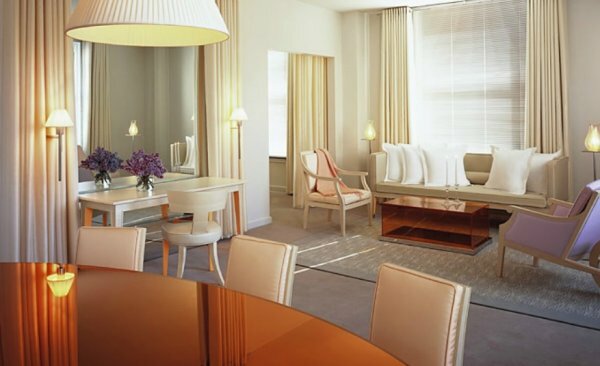 Transparent orange acrylic tables lend a dash of vibrant color and floor-to-ceiling mirrors reflect the roseate Bay Area light. Philippe Starck’s brilliant design extends to the bathroom, where a molded porcelain and white maple sink glows from within. Restore and refresh with MALIN+GOETZ bath amenities. 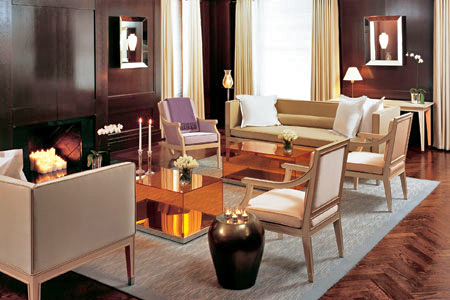 This spacious and elegant room surrounds you with richly layered and sophisticated design. From the English sycamore custom-made sleigh bed to a soothing yet stimulating lavender and tangerine color palette to the Louis XVI-inspired armchair designed by Philippe Starck, everything showcases inspired luxury. Floor-to-ceiling mirrors capture and reflect the light. An inventively stocked bar satisfies any appetite, while MALIN+GOETZ bath amenities and sumptuous Italian percale linens soothe the body and soul. 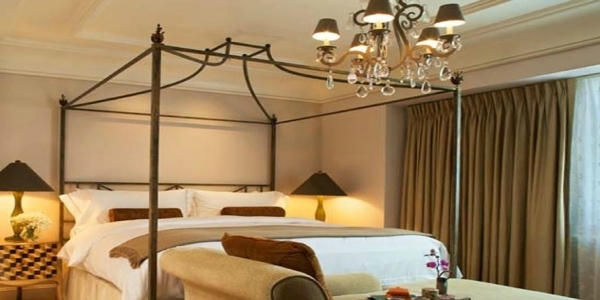 This spacious and elegant room surrounds you with richly layered and sophisticated design. From the English sycamore custom-made sleigh bed to a soothing yet stimulating lavender and tangerine color palette to the Louis XVI-inspired armchair designed by Philippe Starck, everything showcases inspired luxury. Floor-to-ceiling mirrors capture and reflect the light. An inventively stocked bar satisfies any appetite, while lavish MALIN+GOETZ bath amenities and sumptuous Italian percale linens soothe the body and soul. You’ll find every need met and your desires fulfilled in this generous suite, a harmonious blend of comfort and high style. 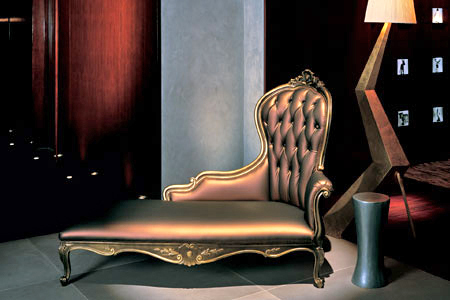 Custom-designed furniture by Philippe Starck features English sycamore, velvet, leather and chrome. 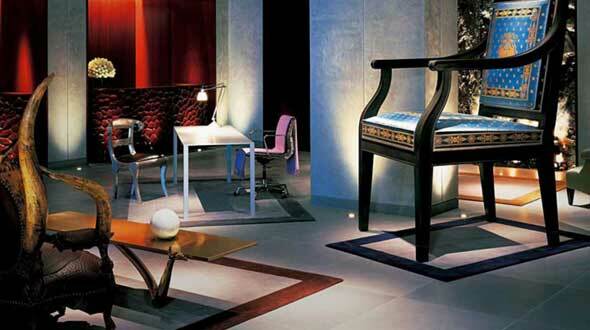 A wooden “wheelbarrow” chair inspired by Man Ray is illuminated by a custom Venetian Murano glass lamp. A formal dining room is ready for entertaining. 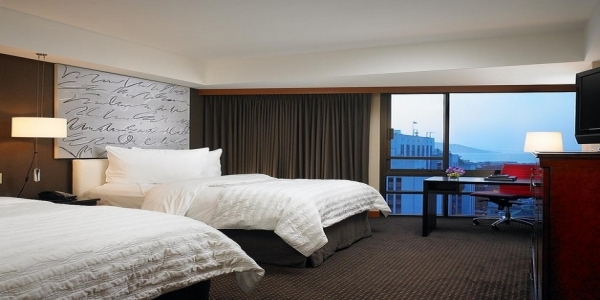 The custom 400 thread count bedding, down duvet and imported Merino wool blanket enfold you in lavish softness. Luxurious MALIN+GOETZ bath products offer another opportunity to indulge. A haven of luxury, this suite offers high ceilings, a formal dining room and a sumptuous oversized bathroom with dressing area. 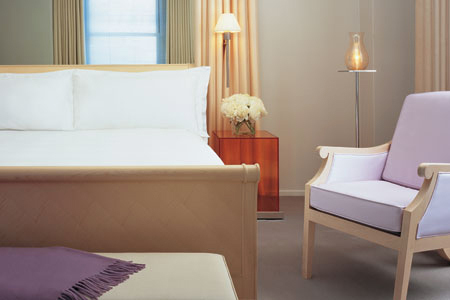 Enjoy fine linens, MALIN+GOETZ bath amenities and a state-of-the-art entertainment center. Beautifully crafted and detailed furniture designed by Philippe Starck features English sycamore, silk, leather, velvet, chrome and Venetian Murano glass. Outfitted in tranquil and warm shades of ivory, grey and lavender, this divine space exudes a sensual softness that is a welcome counterpoint to the hustle and bustle of urban life. 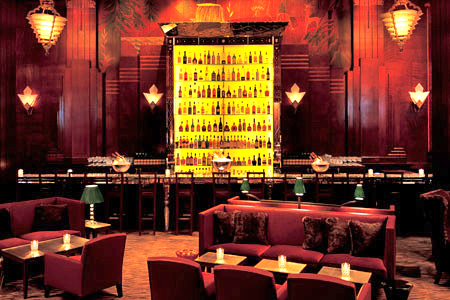 Clift’s famous and historic Redwood Room has been restored and reinvented as an exceptionally elegant and modern San Francisco bar. 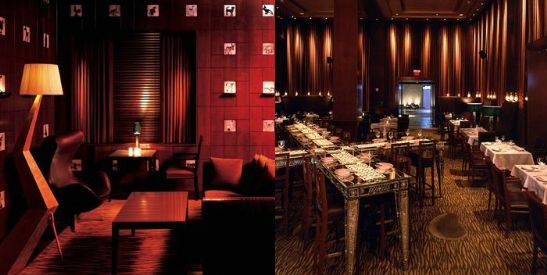 Suffused with all-out glamour, the interior features the original redwood paneling and enormous bar, which, legend has, was carved from a single redwood tree, as well as Starck-designed lounge furniture and an ever-changing array of digital artwork displayed on plasma television screens hung throughout the room.